Propeller plugs have one or two propellers, usually one at the head and another at the tail. When the plug is retrieved or jerked the propeller blades revolve and throw a spray. Although screw eyes can be used to hold the propeller blades, a much better and stronger method is to rig this plug with a wire running through the center, as shown below. When making this plug, drill a hole through the center, from the head to the tail. If you have a drill press, do this with an extra long drill and a jig which will hold the plug body in the correct position. You can also drill such a hole very easily with a hand drill—if you do it before the plug is shaped. In other words, drill the hole in the rectangular block of wood through the center, then rasp and file to finish the plug. 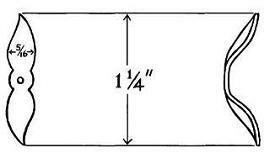 To find the center of the block of wood, draw an X from corner to corner. The propellers for this plug can be cut out of sheet brass, as shown below. You can do some of the cutting with hand snips, then use flat and triangular files to finish the job. A hole must then be drilled in the propeller. Finally, twist the blades in opposite directions and slant them back so they will spin. To assemble this plug you need some wire such as the heavier gauges of stainless steel wire. Cut a short length of about 7 or 8 in. Then, using the round-nosed pliers, form an eye on one end (instructions for doing this can be found in Making Fishing Leaders ). But before you complete the eye, slip on a treble hook. Then slip on a washer, which will act as a bearing for the propeller blade. This can be a disc or cup washer, a grommet or a bead, whichever is handy. Next, slip on the propeller blade, add another washer, and run the wire through the wood plug body from the rear or tail. Slip on another washer, then the second propeller blade, and finally the remaining washer. Now form the second eye in front, to which the line will be attached. To complete the plug, screw in another treble hook at the belly.